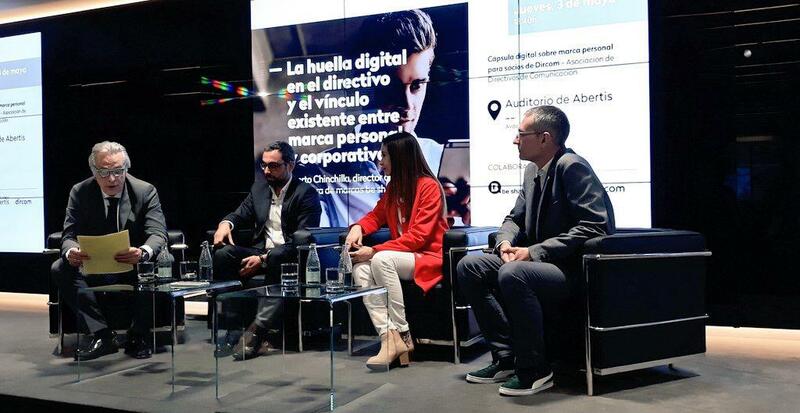 Last week, during the DIRCOM event at the magnificent Abertis Auditorium, we had the opportunity to discuss the role of Top Executives in Social Networks and how to manage their Personal Brands as assets in the communication strategies of organizations. Amazing value all over the place! I’ll start by strongly stating that Visibility creates opportunity. That is the guiding principle that we need to have always in mind. Opportunity and Business will not find us if just a few people know that we exist. One of our main goals should be, first, to be seen, to be known. Once they know of us, and they have seen us, potential partners, recruiters, customers will be interested to know more of who we are, and they will navigate to see our profile. That’s when we need to be ready and, as discussed in many posts before, offer the best professional version of ourselves on the net and social networks. We need to have a great Professional Brand. When they see a great professional profile, where we build our credibility, they will start to develop a sense of TRUST that will bring them closer to buy you. In order to be able to attract business, we need to develop the right social attitude. Let’s see what the key characteristics of this social attitude are. One of the key treat of the right social attitude is to have respect for others. Treat other people as you would like to be treated. None of us likes to be spammed or treated as a number or, for example, be sent emails that are cut and paste without even our name on it. “Dear connection” and expressions like that need to be crossed out of our vocabulary. This is a one to one conversation and conversations happen when respect is in place. The right approach on social networks is “Giving before Asking”. Just as we wouldn’t ask a favor from someone we don’t know in real life, online please follow the same rule. Get to know the person, interact with them, often the best way to gain trust is by providing value, by giving them something of their interest, and then, when the time is right, it is ok to ask for something. I’d like to recommend the book “Jab, Jab, Jab, Right Hook” by Gary Vaynerchuck who deep dives in the motivation to offering massive value before asking for something. Please remember that we are in a much better position if we are asked to do something for others than if we ask someone to do something for us. Our goal would be to attract people that ask for our business, not the other way around. It’s important in the process of creation of TRUST, that we project who we really are. First, it’s difficult to fake someone who you are not, all the time. It’s exhausting and frustrating and wouldn’t last long. It’s just not who we are. We need to stop trying to be someone else. Second, people trust other people even more when we are brave enough to expose our weaknesses, our frustrations and failures. They realize that we are not a fake product when we show who we really are with ups and downs, just being who we are: authentic, honest and transparent. Successful professionals that attract leads have a mid-to-long term perspective. Relations are not a quick transaction game. We need to invest in them. There are many books and authors that explain the benefits of helping other people as a way to be successful in turn. Build a solid and long-lasting relationships with your clients. In fact build long lasting relationships with everyone. That’s a true winning strategy. In business and in life. I’d like to recommend reading “Never eat alone” by Keith Ferrazzi, to dive deeper into the power of genuine willingness to help as a strategy to pursue success. Another recommendation is not to saturate the medium with spam or advertising. Always have in mind the impact of our actions. We need to add value to our clients and connections. Our professional brand is at stake. If we persist in spamming our connections, they will start to shut us off and we will lose credibility. The final recommendation would be that tone DOES matter. As daily consumers of massive amounts of content, we are able to see what is a fabricated and what is a corporate message, and we are starting to get tired of the corporate tone and messages. On the other hand, we do appreciate direct, honest, close and fresh one to one conversations. The challenge of our social attitude strides in finding the right tone between being close (but not too much) and being professional (but not fabricated). We are all tired of canned corporate messages. Being present alone is not enough. Our brand is something that is alive and that we need to maintain. It’s not something that we do once and make a living out of it. Activity will maintain our brand and sustain attraction of business. We cannot expect immediate results. This is something that we need to believe in and invest time in, be perseverant, insist and create habits to make it a daily routine. Some businessmen complain that they don’t have the time for it. Don’t be mistaken, this works better than many other business attraction tactics that we may be currently doing. So why not ask ourselves what we need to stop doing and allocate the right time for this? Thank you for reading and good luck in finding your personal social attitude that gets you closer to success! Enter your email address and stay updated on the new features of Execus.